The first thing you'll probably notice about Symphony of Eternity is that it's a bit pricy compared to most other games and apps available in the Market and there's no trial version available, so hopefully this review will help you decide if it's right for you. The introduction takes part in a castle, and you learn that a coup d'etat is taking place. The captain of the guard urges the princess to leave the castle, while he stays to fight… Outside, we are introduced to Kreist and his companion Dauturu who briefly discuss goings on at the castle before the game leaves you in charge. These next few screens introduce you to the gameplay, and rather than the random encounters featured in many games of this style, the enemies are represented by sprites on the screen, so you can try to avoid them if you wish. 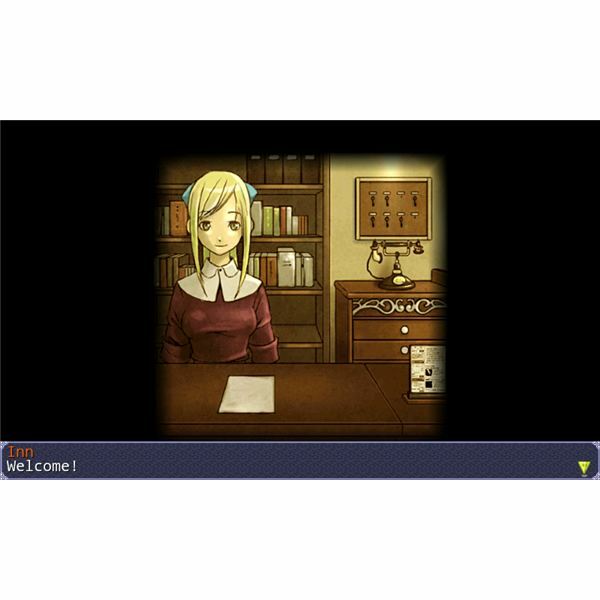 After a few screens, you encounter the princess from the castle, who you accompany to the nearest town, (accessible via the overworld map), here you learn that Kreist and Dauturu are seeking something called Regratlute, an item that grants the wishes of whoever holds it. Laishutia, the princess, asks to join you on this quest, so that she might use the power to get her kingdom back. The town features the usual array of shops that allow you to purchase items and weapons before you leave to visit some ruins that might hold a clue as to the whereabouts of the Regratlute. After battling your way though a few floors (and your first boss battle), you'll discover that the item you seek doesn't exist, but you might be able to create it by combining the power of the six spirit elements. Sounds like our quest has only just begun. Symphony of Eternity doesn't push your Android phone to its limits with any flashy graphics, but you do get something similar to JRPGs from the SNES era, along with portrait sketches of the characters that are talking. 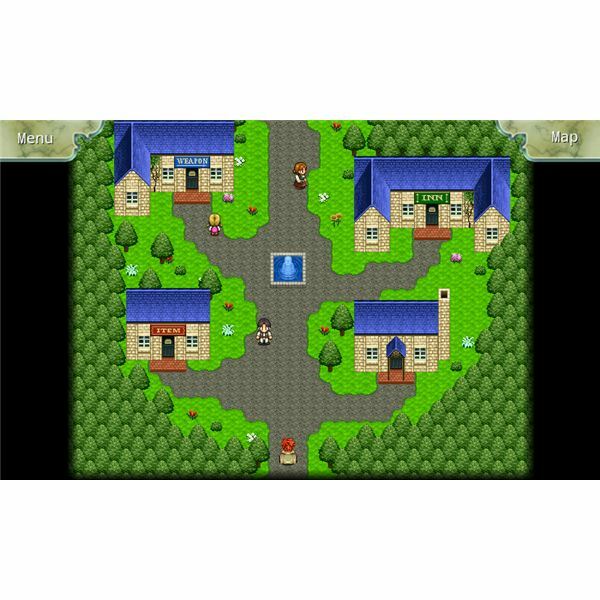 The overworld map is best described as functional, but the in-game graphics are much better. The sprites used to represent the enemy make it clear who you'll have to fight if you engage them (although you won't know how many there are, or if there are other kinds of enemy as well). Music is fairly standard as well, each area has its own theme, and you get a nice little victory tune when you win a battle. 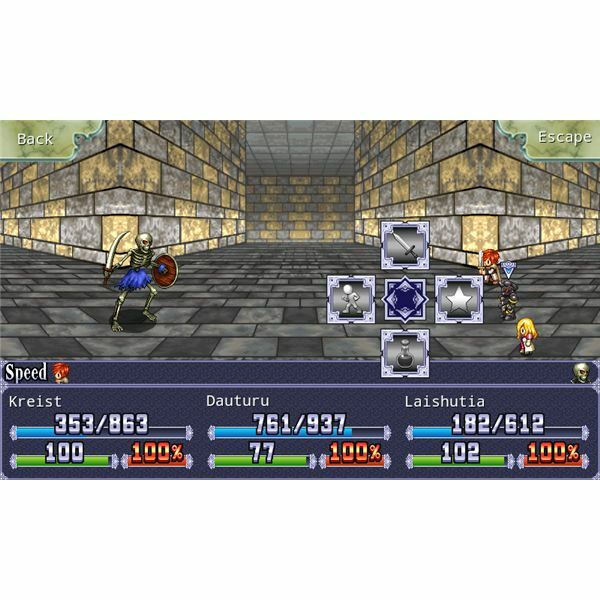 Like most RPGs of this style, the gameplay can be broken down into three sections. 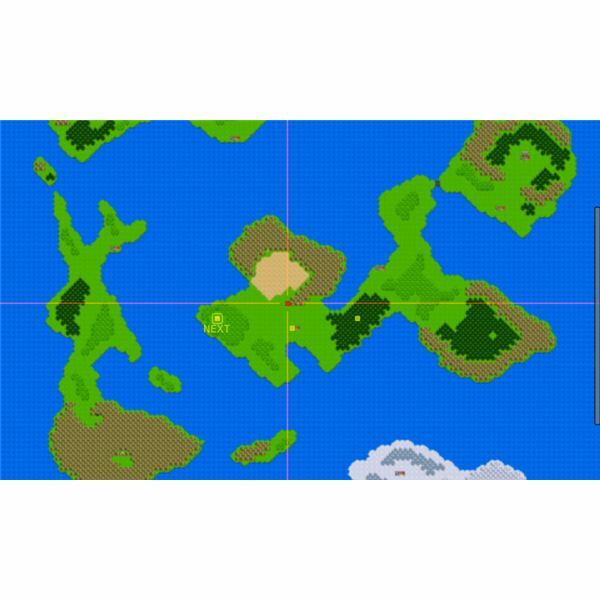 The overworld map, which allows you to travel from one location to another. A nice touch here is that you can click the 'Map' button, and you'll be shown an overview of the whole map, along with a marker of where to go next; useful if you haven't played the game for a while. The Map button also shows you your surroundings on the main game screen — not very useful in the single screen forest at the beginning of the game, but it certainly comes in handy when you're moving around the dungeons. You control the characters with an on-screen pad, but there are options to allow you to move the pad (which otherwise sits in the bottom left of the screen and can obscure your view), or use touch movement, but this isn't very accurate; especially if you want to try and avoid enemy encounters. The final section is, of course, the battle screen. Your party appears on the right, the enemy on the left, with your party's vital stats at the bottom of the screen. When it's your turn, you have the option to attack; use one of your characters skills (at the cost of magic points), use an item, or change their stance from normal to defensive (reduces damage taken, but also damage caused by physical attacks). A menu system, accessible at any point (apart from in battles) allows you to change your characters equipment — use items to heal them or remove any status inflicted on them in battle. You can also pick up tablets, that allow your characters to learn new skills and, of course, you can save your game; conveniently for a mobile game, you can save at any point, not just on the overworld map or at save points. If this sounds like it might be the game for you, you might want to take a look at these other RPG games available for your Android phone. If you want to play a Final Fantasy style game on your Android phone, then Symphony of Eternity is well worth the money. If you have any doubts, then the introduction is very brief and there's probably time to at least play a few battles before the 15 minute refund period is up; unless you already played them to death when you were younger though, you might want to consider downloading a SNES emulator and playing the real thing.